Interested in selling vehicles in Maryland? Whether you plan to embark on a business with new or used cars, the first and most important step of the process of becoming an auto dealer is getting your license. Anyone looking to sell more than 5 vehicles in a 12 month period is required to obtain an auto dealer license under Maryland’s state legislation. The process includes a number of requirements to comply with and getting an auto dealer bond is an essential part of them. Apply for your auto dealer bond today and lock your rate for 90 days! Before delving into the documents required for obtaining a Maryland dealer license, let’s have a look at the types of licensing options. After you choose your specific type of dealership license, you can proceed to the next step: get an application packet from MVA’s Business Licensing and Consumer Services. Even though most dealer licensing application packages are relatively similar, there are still minor differences, so you want to make sure you received the right package for your specific license. 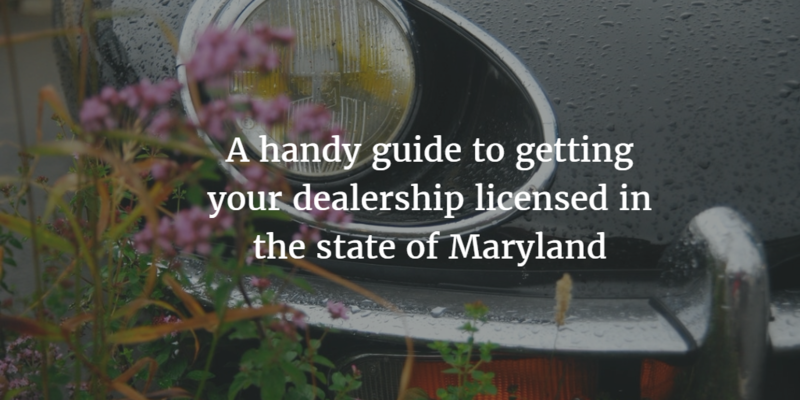 Let’s have a look at a brief summary of all the requirements you need to comply with in order to get a Maryland dealer license. Fill out an Application for Vehicle Dealer License. Complete a Zoning Approval Form signed by a zoning official from the jurisdiction where the facility will be located. Get a Maryland Auto Dealer Surety Bond. Provide a Proof of Workers’ Compensation insurance or exemption from coverage requirements. Obtain a Maryland Criminal Background Check. Provide a Copy of a Trader’s License. Provide a Business Registration Letter from the Maryland State Department of Assessments and Taxation (SDAT). Provide an Automotive Repair Facility Contract that certifies you will have a repair facility within 5 miles of each dealership location. Get a Franchise Approval Letter from the Manufacturer (not required for used vehicles and wholesale dealers). In addition, a Letter of Good Standing, Use and Occupancy Permit, or Dealer Orientation Request may be needed, depending on your specific situation. It’s best that you check with the MVA about those requirements. One of the most important stages of getting your auto dealer license in Maryland is posting an auto dealer bond. The Maryland auto dealer bond is a type of surety bond that guarantees you are going to act in accordance with the law. Ultimately, it protects the state of Maryland and its citizens from any fraudulent activities the dealers might engage in. The surety bond amount stands for the maximum compensation that could be awarded in case of a proven claim against the dealership and it depends on the amount of vehicles you sell or plan to sell. However, as a car dealer you are not required to pay the whole amount but just a fraction of it, also known as premium. In order to calculate your final surety bond cost, you need to know that usually the percentages for standard bonding market are between 1% and 3%. So, for example, for a $50,000 Maryland auto dealer bond you’ll have to pay between $500 and $1,500. Start your auto dealer bond application. 100% money-back guarantee! 2016 Florida Auto Dealer License and Bond Renewal Deadline Approaching!